Grassroots Films, the company that produced the USCCB's award-winning short film Fishers of Men, is hosting a showing of its new film tomorrow at 1:00 p.m. in Del Mar. The one-day showing is free but requires registration. The location will be Del Mar Ultra Star Cinemas, Flower Hill Mall, 2630 Via de la Valle, Del Mar, California. 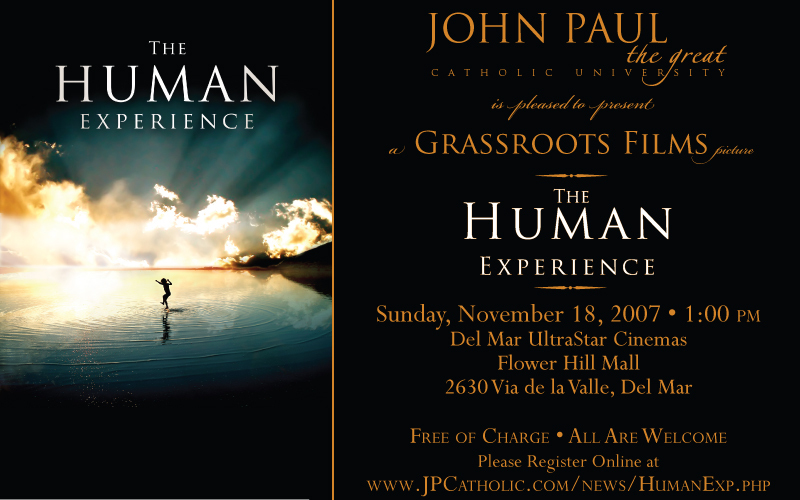 You can register online on the website of John Paul the Great University. Thomas Peters has a megapost on the movie at American Papist. The movie "Amazing Grace," about William Wilberforce and his campaign to end slavery, will be available on DVD beginning November 13. You can pre-order the DVD at the film's official site. Earlier posts about the movie and the related movement in opposition to modern day slavery can be found here and here. Tonight in Hollywood, the Catholic Academy for Communication Arts Professionals awarded its 2007 Gabriel Award in the category of religious video in a national release to the USCCB film "Fishers of Men." The award is in one of several categories listed under "Television" on the official list of winners. The entire 18-minute video is shown here in Google video form. The video was produced by Grassroots Films of Brooklyn as part of a program by the USCCB to encourage young men to consider whether they may have a vocation to the priesthood. The successful film has drawn international interest and will soon be available in other countries. Zenit has an article about the film and the award. The USCCB has a press release about it, and its Vocations & Priestly Formation Department Page has an announcement of the award with links for more information about the video. An earlier post from March 26, 2006, mentioned the film when it was first released. Two items caught my attention today that have, as their common element, the Church and Russian faith and culture. One of the two is actually several weeks old, but I only became aware of it today. The new item, of the two, concerns a historic visit to Paris next Wednesday by Russian Orthodox Patriarch Alexis II. Patrice de Plunkett reports, based upon an announcement yesterday by Cardinal Jean-Pierre Ricard, the president of the French Bishop's Conference. Cardinal Ricard will receive the Russian Orthodox Patriarch at a luncheon at the House of the French Bishop's Conference on October 3 at 12:30. At the end of the day, the Patriarch will be welcomed by Archbisop André Vingt-Trois, Archbishop of Paris, at Notre Dame Cathedral, where he will venerate the relic of the Holy Crown of Thorns. This will be the first visit by a Patriarch of Moscow to Paris, and an important ecumenical event. The other item I came across today is the Vatican's giving the Robert Bresson Award to Russian filmmaker Aleksandr Sokurov at the Venice Film Festival on September 6, as reported by Russia Today. That article explains, "Aleksandr Sokurov’s films analyse eternal matters. Rich in atmosphere and music, they speak of life, death and power." Not being a movie buff, I really know only one of Sokurov's films, but I have seen that one several times and think it is magnificent: Russian Ark. The YouTube videos from Russian Ark shown here include (1) an intriguing 10 minute portion involving Russia's Christian heritage shown in art at the Hermitage Museum and (2) the film's preview showing some of its beauty. It is a complex film that is easily worth watching twice in a first sitting. There is much subtlety best understood after watching it all the way through. I watched the History Channel's "The Dark Ages" last night and thought it was well worth watching. I looked for Catholic blogger reviews this morning and have not found any yet. I'll check again later and add to this post any that I think are particularly good. I did find a medieval/fantasy blog with a favorable review written after an advance viewing. As suggested by one of the reviews I linked to earlier, the show does a good job given that it is only 2 hours, while fitting 600 years into 2 hours could provide only a basic overview. What is terrific about it is that it accurately covers details about what caused and perpetuated the Dark Ages, and about the Church's role in preserving books and literacy and in bringing Europe together during that era. If you missed it, it will air again Saturday, March 10 at 8:00 pm Eastern. A DVD is also available for purchase. Amy Welborn saw "Amazing Grace" at the movies and posted her very thoughts about it, calling it "definitely worth seeing for several reasons." Personally, I am thrilled to see a major movie studio make a movie that presents Christianity in a favorable light. While they have done that before with regard to the opposition to slavery, at least in the way they presented the white Unitarians of Boston and the black Christians in "Glory", Samuel Goldwyn Films still ought to be shown appreciation for a picture well done. Sunday night, The History Channel will premier its 2-hour special, The Dark Ages, featuring commentary from experts in that area of history. An article previewing the special, by Luaine Lee of McClatchy-Tribune News Service, sounds like it may be good. According to Lee, the featured experts include Tomas R. Martin, chair of the classics department at Holy Cross in Worcester, Massachusetts (a Jesuit college), and Brett Whalen, assistant professor of History at the University of North Carolina at Chapel Hill. Variety's reviewer, Brian Lowry, wrote that the show "does the best it can" to fit 600 years into a 2-hour special, although he also says it "never really comes alive." Both reviews mention the role of the monasteries in preserving classical knowledge through the early Middle Ages, and Variety mentions that some of the scholars on the show question the validity of the term "dark ages". It will air Sunday at 9:00 p.m., 8:00 central. A DVD is available. Watch the trailer here for the movie about William Wilberforce, the British politician who led the fight to end the slave trade in England 200 years ago. His mentor was John Newton, the reformed British slave trader who became an Anglican priest and wrote the hymn "Amazing Grace." Also see the webpage for Amazing Grace Sunday. The idea of Amazing Grace Sunday is for churches everywhere to sing the hymn on Sunday, February 18, in thanksgiving for the abolition of the slave trade and in prayer for the remaining work of racial healing and equality. Today, 27 million people still live in slavery throughout the world. Into Great Silence, the film about life in the Grande Chartreuse monastery, will have its U.S. premiere (other than film festivals) in New York on February 28. Here is a link to the current schedule of release dates and theatres in various cities. Here in southern California, it will play at the Nuart Theater in Los Angeles on March 9 to 13, and it will open at the Ken Theatre in San Diego on April 6. Check the schedule if you want to see the movie in a theater, because there are some cities where it will only be shown for one day or a few days. The film has been a great success in other countries where it is being shown. La Croix today reported that the movie has been an incredible success in France since its release there on December 20, drawing more than 120,000 viewers although it has only been shown on 13 screens. Other countries have also reported great successes. The film was previously shown at several film festivals and won the European Film Academy's award for the Best Documentary of 2006.